In 1949, Charlotte Brown had her expansion plans thwarted by the local council. 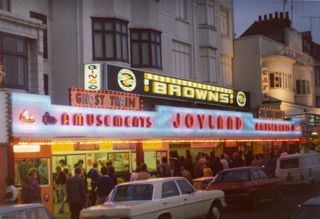 She decided to expand the amusement arcades fronting onto Esplanade. This part of Joyland had developed by converting three existing shop units. Charlotte saw that there would be the potential to cover over the extensive yards to the rear of one of the units to create a much larger arcade. However, Bridlington Corporation refused to grant planning permission for the development, being concerned that it could create an undesirable precedent for further similar expansion elsewhere on this frontage. Clearly, the development of amusement arcades did not have the full backing of the Council even at the end of the 1940s. On this occasion, Charlotte Brown managed to get the support of Bridlington Corporation, which stated, in a letter to the County Planning Officer in February 1956, that: “the development was compatible with development which had subsequently been approved at adjacent premises.” Planning permission was granted in March 1956. For whatever reason, this work was not implemented. In fact, it would be over four decades later when the future owners of the complex would finally undertake this work.